WeSchool or Welingkar Institute of Management Development and Research has been established in the year 1977 with the vision to provide quality education. The S.P. Mandali's Prin L.N. Welingkar Institute of Management Development and Research (WeSchool) works under the guidance of S.P Mandali Trust, which is one of the oldest trust working in the education sector. It has the features of successfully running 43 educational institutions across the country and more. 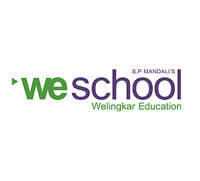 WeSchool has two different campuses located one in Mumbai and another one in Bengaluru. There has been some very progressive changes in the past years with the institutes and which is significantly helpful for the education and industry environment. It is known for reinforcing the ties between the academia and industry and bridge the gap. The same finds expression in its contemporary programs and futuristic training; a perfect blend of concepts into real time problems. Along the conventional specializations that are considered an ideal section of management studies, the Institute also offers programs in Business Design, E -Biz, Research and Business Analytics, Rural, Retail, Healthcare and Media and Entertainment as a focused learning programme. The institutes has achieved certain recongnitions and accreditations. The postgraduate diploma in management or commonly known as PGDM is the professional learning courses of the Welingkar Institute of Management Development and Research. It offers the specialization in Marketing, Human Resources, Finance and Operation of any typical management system. During the course of learning, it helps to discover and find the true potential of students. During the rigor practicing and focused hard work will help students to choose the specialization of their choice in the various management fields. The institute has a strong commitment to develop thought leaders and masters of innovation in management with the comprehensive business management courses it offers. In order to meet the challenges of tomorrow, the institute is constantly working on the path for development. This flagship programme has the scope and opportunity to incorporate these new trends while providing the basics of management education. It develop and grow the world-class managers with strong analytical tools, business philosophies and exposure to real-life unstructured situations and get the best resources for the business world. WeSchool's has a unique Profile based selection process. It assigns significant value to the academic performances, work experience, Group Activity, Personal Interview along with the written test scores of an individual. The admissions are based on merit only after successfully completing the selection process. Strictly no discrimination is made on the basis of the state from which graduation certificate is obtained or by any other mean. Along this, there are no reservations for linguistic minorities either during the admission. ₹ 90,000/- p.a. to ₹ 150,000/- p.a.